ORLANDO, Fla. (CNS) — The U.S. Catholic Church’s increasing diversity presents Catholics with the opportunity to accompany each other on the journey of faith Pope Francis envisions, a Boston College professor told delegates to the “Convocation of Catholic Leaders: The Joy of the Gospel in America” in Orlando. Hosffman Ospino, associate professor of theology and religious education at Boston College, said the changes in the landscape are a sign of strength and present new opportunities to welcome newcomers into the church family. Ospino suggested that Catholics of the first decades of the 21st century might begin to understand that they can set the course of a “new Catholic moment in the U.S.” by embracing diversity. Citing the explosive growth of Catholic communities in the American South and West, Ospino said the church is being called to respond to the needs of new immigrants so that they are welcomed and not made to feel forgotten. He said half of U.S. church members today are non-European, with about 40 percent Latino, 5 percent Asian and Pacific Islanders, 4 percent African-American and 1 percent Native American. The numbers contrast with the church population of 50 years ago, when 80 to 85 percent of Catholics were of European descent, he said. “The question is do we see those faces in our faith communities? Do we see them in our diocesan offices? Do we see them in our Catholic schools, universities, seminaries? Do we know their concerns?” he asked. “The future of U.S. Catholicism is being forged in areas once not central to U.S. Catholic life. … Are we paying attention?” he asked. “This is an excellent opportunity for us as a country to be a poor church for the poor. As Pope Francis reminds us, an opportunity for solidarity of Catholics at all places,” he said. Ospino also cautioned that the church faces challenges from increased isolation, rising secularization and increasing numbers of people unaffiliated with any faith community, and the continuing differences entrenched in the “so-called culture wars.” He called for respectful dialogue among people with differences of opinion across the spectrum of issues that concern the church, from abortion to care for the poor. “Our society continues to witness an erosion of communal life. If communal life is not important, advocating for others is not a priority. Caring about the most vulnerable is somebody else’s problem,” Ospino said, explaining that the church can bridge such gaps. He said the convocation-goers and those they engage when they return to their home parishes and dioceses can set the tone for future historians to see that they have laid the foundation for a stronger church that embraced diversity and inclusion. In response, four panelists offered their insights into the changing landscape the church is facing, saying that the church will be better positioned to respond following the convocation. They addressed issues of women’s role in the church, the need to embrace young Latinos as active church members and the vital role of family in the church at a time when society’s understanding of family is changing. Franciscan Father Agustino Torres, who has worked with youth and specializes in bilingual outreach to Hispanic millennials said he had found young Latinos want to engage in ministries that affirmed their identity. “Latinos don’t want just a program,” he said. “If the church can say, ‘You belong here this is your home,’ you’re going to get an army of people,” he said. Women can be welcomed into church leadership roles that do not depend upon ordination, said Helen Alvare, professor of law at the Antonin Scalia Law School at George Mason University. She said women must be accepted seriously as contributors rather than being chosen for their roles to check off a box on a list. She suggested, to applause, that Catholics adopt an expanded view of complementarity that applies equally to family and the church. Kerry Weber, executive editor of America magazine, recalled her conversations with parishioners across the country who are seeking ways to live out the joy of the Gospel, as Pope Francis envisioned in his encyclical, “Evangelii Gaudium” (“The Joy of the Gospel”). “People are trying to see how to turn this sentiment into action,” she said. Jesuit Father Thomas P. Gaunt, executive director of the Center for Applied Research in the Apostolate at Georgetown University, said the center’s researchers have identified as many as one-third of the country’s 75 million self-identified Catholics are not connected with the church. He said the resulting question focuses on why people who may not be connected with the church still consider themselves Catholic and he suggested that they represent an untapped resource for the church. “How do we re-invite and re-engage them once more?” he asked. 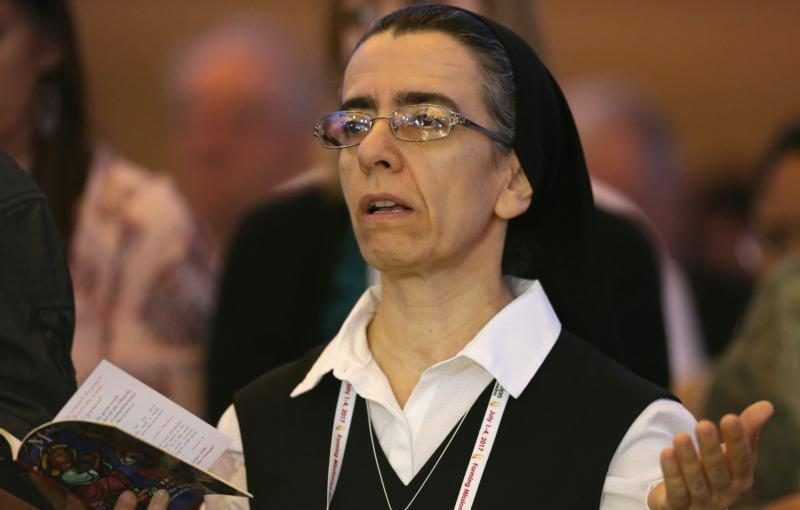 The key, Ospino concluded, is that it is time for the church to start building a “language of communion” rather than dividing the church community into different groups and individually responding to those needs.